In the context of Thai cuisine in general — and this may come as a surprise to some — the sole function of peanut sauce/satay sauce is to serve as an essential part of a typical satay ensemble. It is not used in or with anything else. It’s not used to dress noodles; nor is it used in a stir-fry or as a dipping sauce for spring rolls. For darn sure, it’s not used as a pad thai sauce. I may occasionally turn it into a salad dressing by adding more vinegar to it or serve it with a non-satay item such as fried tofu, but neither application is common. To the best of my knowledge, other than satay, there is no other Thai dish in the current mainstream repertoire wherein satay sauce is used. There is one exception: a dish oddly named “Swimming Rama“. Even so, with the background of this dish being so closely connected to Chinese-style pork satay in Thailand, we still have not gone beyond the satay realm. The “Rama” part of the name is the reason I alluded to the Ramayana in Part One. If you have visited the Emerald Buddha Temple in Bangkok, you would have surely noticed the story of Ramakian (รามเกียรติ์), the Thai adaptation of the Ramayana, played out in the murals along the corridors surrounding the sanctuary. You would have also noticed that Rama, the main protagonist, is depicted as having green complexion (one of his half brothers is yellow and another is red — long story). Oh, hey, what a coincidence: a main player of this dish, is also green. And to prepare it for assembly, you need to blanch it or — to make it more obvious where I’m going with this — give it a quick hot bath in simmering water. 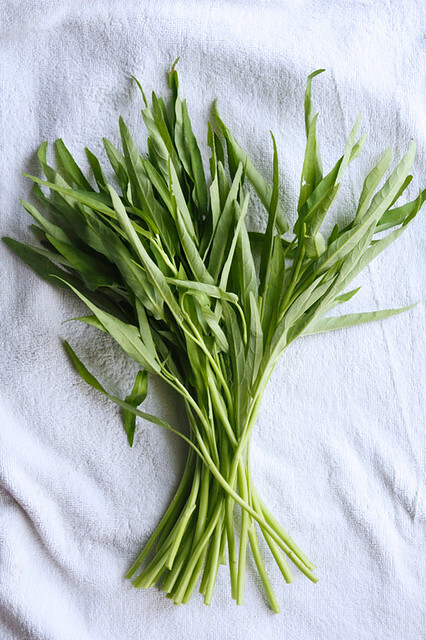 Ipomoea aquatica goes by many names: Chinese water spinach, Chinese spinach, water morning glory, ong choi/choy (the most common in the United States), kangkong, kangkung, rau muống, and, lastly, the Thai name, phak bung (ผักบุ้ง) . If you live in the US and are not familiar with this vegetable, it’s probably best to commit to memory its various names. This is because if you just go by the way phak bung looks, you may have some difficulty recognizing it at the Asian grocery store where it’s often sold mummified in multiple layers of cling film. Making this dish is easy. I always have some cooked rice in the fridge, and I have never been without my mom’s peanut sauce in the freezer. So it usually takes just a few minutes for me to whip up this complete meal on one plate. Yet, even if you have made nothing in advance, it’s still possible to get everything ready in slightly over half an hour (less, if you’re a good multi-tasker). This recipe is one of over 100 easy recipes in my upcoming book, Simple Thai Food: Classic Recipes from the Thai Home Kitchen. It won’t be available until May 2014, but you can preorder the book now in order to get it before anyone else. 1. Most of the time, I’m happy with Mom’s easy peanut sauce as it is. Sometimes, though, when I have more time and am in a mood, I do what one of my favorite Swimming Rama joints does: adding ground lightly-toasted white sesame seeds to the satay sauce. If this is what you want to do, simply toast 1 tablespoon of raw white sesame seeds in a dry skillet over medium-low heat (and under constant supervision) just until light brown. Then you grind them in a mortar, a coffee grinder, or a mini-chopper until they break up into fine powder but not so fine that they have become sesame paste (this photo may help). Stir the ground sesame into the 2 cups of prepared peanut sauce when you’re warming it up. In case you’re wondering, sesame oil — a less laborious means of getting the sesame flavor into the sauce — doesn’t help you achieve the flavor of the dish as you would experience it in Thailand. I’ve tried that route, and, for what it’s worth, I didn’t like its pronounced, overpowering, dark, toasted scent. YMMV. For some reason, tahini doesn’t work very well either. 2. Since the dish is Chinese in origin (or at least popularized in Bangkok by Chinese immigrants), I have taken the liberty of applying a well-known Chinese technique of marinating the meat briefly with baking soda to tenderize it. If you like the soft, smooth texture of meat in various dishes served at your local Chinese restaurant, you may want to try this method. If not, skip the baking soda. 3. The most common choice of meat for this dish in Thailand is the same as the most common choice of meat for satay: pork. But chicken breast meat seems to be the most common choice of meat among Thai restaurants in the United States for this dish and also satay. You can go either way. 4. If you use tofu, I’d go for firm or extra-firm tofu. I don’t recommend blanching it. Instead, I’d cut up the tofu into bite-size pieces and brown them in a lightly greased skillet just to let each piece develop a golden brown crust on all sides. You can lightly salt the tofu before searing it, but there’s no need to even consider the baking soda treatment as it will be completely unnecessary. 5. The only vegetable used in this dish in Thailand is phak bung, but spinach or broccoli is almost always used at Thai restaurants in the US (see the photo below). Use what pleases you. 6. In Thailand, each plate of Swimming Rama is anointed with a dollop of nam prik pao, Thai chili jam. There are often a few slices of fresh hot chili pepper as well (see it here). I personally find the peanut sauce already flavorful enough on its own, but it’s up to you to include or exclude these two elements. Other names attested include Swimming Angel, Bathing Rama, or simply Rama. Or more specifically, phak bung jin (ผักบุ้ง), literally “Chinese phak bung” to differentiate it from other types of phak bungs in the market. Cut the chicken against the grain and on the diagonal (at approximately 40 degrees angle) into thin, bite-sized slices. Put the chicken in a bowl, sprinkle the salt (and baking soda, if using) over the top, and mix well (this is best done with your hand). Cover and refrigerate while you ready the other ingredients. Half fill an 8-quart pot with water and bring the water to a boil over high heat. Keep 2 plates nearby. While the water is heating, if using water morning glory, trim off and discard the bottom one-third of each stem, which is too tough to eat. Cut the remainder of each stalk into 2-inch lengths. If using broccoli, cut into bite-size pieces. Turn down the heat so the water is barely bubbling. Add the chicken and stir gently for about 1 minute, until it turns white and is opaque throughout. Using the skimmer or slotted spoon, lift out the chicken, shaking off the excess water, and transfer to the other plate. Divide the rice evenly among 4 individual serving plates. Place the blanched greens on the rice, then layer the chicken over the greens (there's no hard-and-fast rule here: you can arrange them side by side on top of the rice). Spoon the satay sauce evenly over the chicken. Top each serving with a dollop of chile jam and a few chile slices and serve immediately.